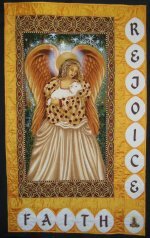 I am a participant in an annual quilting retreat in Phoenix, AZ, held in February. During the 2011 Retreat, I happened to stumble across a pre-printed panel by Michael Miller whilst we were perusing the inventory of a local quilt store, The 3 Dudes. It was hanging on the end cap of an aisle, clipped together with other pre-printed panels. I don't know what possessed me to rifle through the panels, but I'm very glad that I did. But THIS panel, Michael Miller's "Golden Angel", is gorgeous. The palette is comprised of beige/gold/brown tones that are just breath-taking. It is reminiscent of Rennaisance paintings and is surrounded by elaborate borders of uneven sizes. Around the entire perimeter is a border of printed "pearls". Unfortunately, due to the printing process, the narrow 'pearl' border on the sides of the panel can't be used, as there is NO seam allowance between the panels. What a shame ... that means if I want symmetry, I can't use the pearl border on the top/bottom either. How annoying. It so happens that one of Mr. Pirate's cousins is a very religious lady and I knew, knew, knew that this panel had her name written all over it. So, without a layout in mind, I bought the panel. And it sat at home, whilst I pondered how best to use it. Michael Miller has a suggested layout (at left) but Oh My Goodness ... how uninspired. They simply took the dark-toned companion fabrics and put slab-o-borders around the panel. Honestly, it makes the panel look very, very dark. Ick. As I rummaged through my stash for coordinating fabrics, I came across this incredibly luminous fabric. It's breathtakingly lovely. It was unlike anything else in my stash and I'm thinking that it was gifted to me by a fellow quilter who was de-stashing. 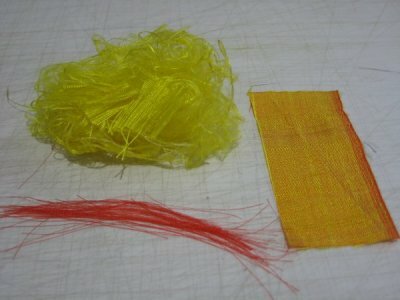 The yellow fiber feels as though it might be silk. I did a burn test on it: it caught on fire immediately although it didn't continue to burn and left soft ash. It's certainly not polyester. It doesn't look like a woven thread; it's more like it's been drawn out than spun. The red fiber is definitely a spun fiber. Very tight and straight. It had the same burn test results as the yellow. Although the golden fabric was a perfect color match, working with the wretched stuff was HORRID. It snags on EVERYTHING .... rough spots on my fingers, other fabric and even itself! It also frays/ravels like crazy. You LOOK at it and it ravels. In one spot, the 1/4" seam allowance had completely disappeared. In a desperate move to stop the fraying, I zig-zagged a very narrow strip of a water-soluble stabilizer to every raw edge. It'll dissolve when it's spritzed and then pressed. The fabric might be a silk-cotton combination or not. I'm thinking it might be a shot cotton. From some investigation, I found that "Shot cotton is special because the warp and weft yarns are 2 different colors woven together to create a special depth, a "shot" of color. When the edge of this fabric ravels, you can see a bright contrast to the body of the fabric." That certainly described the fabric that I had. But, eventually, I was told that it was Dupioni silk. If I ever work with this stuff again, it will be too soon. As for my design, I came up with an asymmetrical design: I bordered the panel with strips of the Dupioni silk. Then I pushed the bordered panel into the upper left corner of the layout. 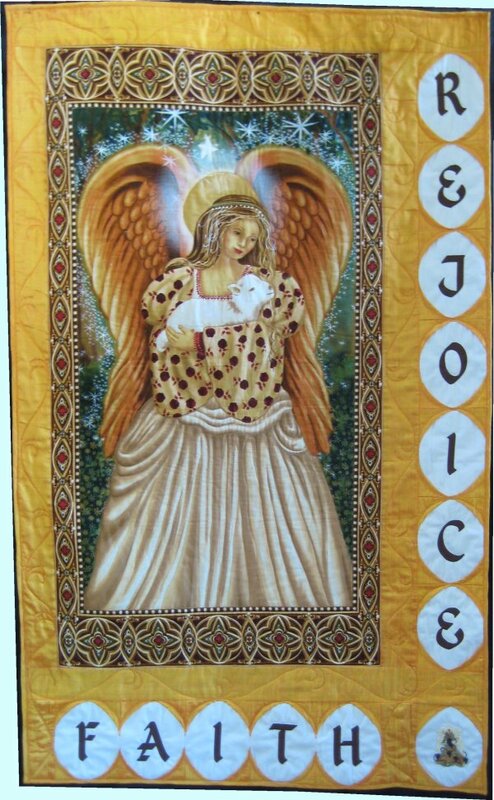 On the right side and on the bottom, I put machine embroidered letters, spelling out "rejoice" and "faith". The original layout (seen at left) called for the embroidered letters to be stitched directly onto the fabric. But that was before I had found the Dupioni silk. There was NO WAY I was going to risk embroidering on the limited supply that I had. Instead, I stitched the letters onto plain fabric. Then, I came up with a sneaky technique for framing the machine embroidered letters: the Cathedral Window technique! A square of Dupioni is folded in half diagonally. 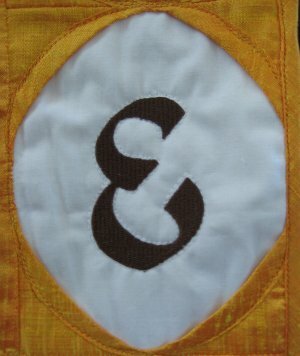 The straight of grain edges were sewn to the corners of the base fabric with the embroidered letter, leaving the biased diagonal fold towards the center of the block. That folded edge is then rolled/folded back onto the square itself, resulting in a lovely curve around each letter. I chose to top-stitch the curve in place near the original diagonal fold, using a clear monofilament thread (Monopoly by Superior). The alphabet came from Sew Forum "Petrock". but it doesn't show up at this time. This is based on letterforms found in a small city Church in Exeter - St Petrock's, and is from a display case about bell ringing. Originally, I thought to put a traditional Christian symbol in the lower right corner but THEN ... 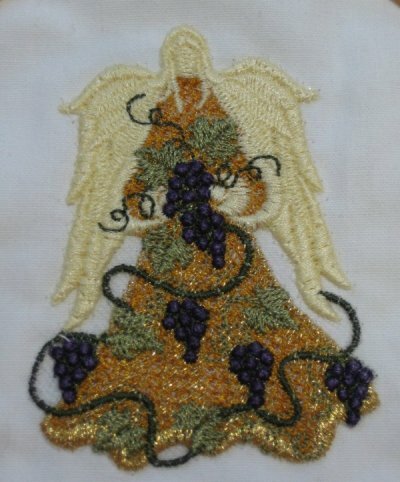 I found Sonia Showalter's Angel of the Wine Harvest, a free-standing design. Sonia does exquisite designs. They are absolutely, positively faultless. They stitch out beautiful and consistently, every time. Sonia is one of the true digitizing masters of our time. 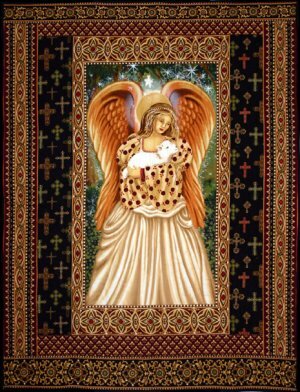 I promptly replaced the tentative Christian symbol with this machine embroidered angel in the bottom right corner. I've come upon this problem with other free-standing designs that I wanted to use on fabric. I figured out a solution which works rather admirably, if I do say so myself. I hoop bridal tulle with a water-soluble stabilizer and stitch the design on it. When the stitching is finished, I dunk the entire thing in water, which, of course, dissolves the stabilizer, leaving the free-standing design stitched on the tulle. I then clip the tulle away extremely close to the edge of the design. This gives me an "applique" of sorts. The final step is to stitch the edge of the design to the base fabric with a small zig-zag stitch using monofilament thread (I used "Monopoly" by Superior Threads). This technique allows you to put the dense free-standing design onto fabric without "cupping". 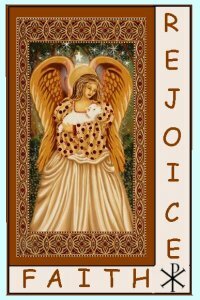 This Angel with grapes was particularly appropriate for our family, since the family grows wine grapes in their vineyard. My final layout is what you see on the right and a larger version can be seen at the top of the page. 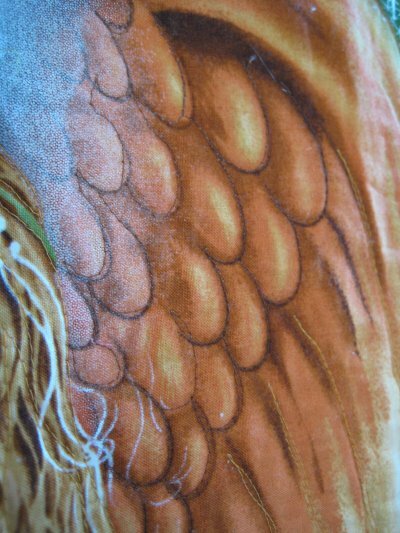 The bias binding was also done in the Dupioni silk so there is a continuous wash of color right to the edge. The backing is a standard quilting cotton in a mottled yellow. The batting is Hobb's 80/20. As for the quilting ... oh, yes, the *quilting*. It *almost* went smoothly. Not wanting to diminish any part of the panel, I simply outline stitched in all the major color lines using a matching So Fine thread by Superior. This quilting went quite nicely. You can't really SEE the quilting in these two pictures. And that is the ENTIRE point. I didn't WANT the quilting lines to be seen. That's the beauty of So Fine thread ... you can absolutely blend the thread into the fabric so there is no distraction at all. Even in the printed borders, I used So Fine and followed the design lines. 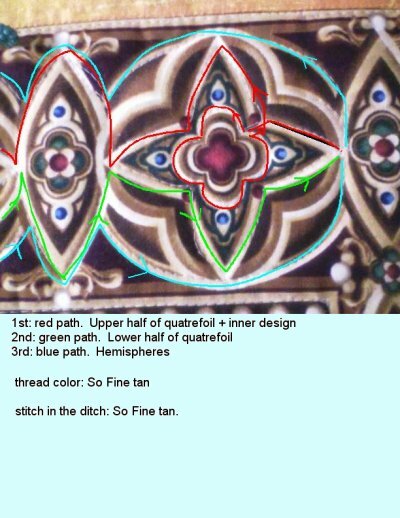 The colored lines show the different stitching paths I took when quilting the printed borders. And then ... the Dupioni. I also used a matching So Fine. Most of the quilting in the borders went smoothly. So I thought. I was almost done when Life Happened and I needed to take a break, which lasted for about 1-1/2 months. By the time I returned to quilting the last border, I couldn't quite remember how I had done the other ones. :-( So, I procrastinated some more about getting back to the last little bit of quilting. But finally, even I couldn't procrastinate any longer and I returned to Lizzie. And it occurred to me .. duh .. all I had to do was unroll the wall-hanging and LOOK at what I had done previously! What a nincompoop! Since the wall-hanging was loaded sideways, it was only a matter of a few rolls and the other border was revealed to me. It wasn't as scarey as I thought I remembered. :-) So, I happily began the last little bit of quilting. And then the tension problems started. Oh. My. Gosh .. Just shoot me now. Thread breaking. Re-threaded. Tension problems. Thread breaking, New needle. Tension problems. This went on for about an hour or so .. me wracking my one brain cell for a solution and searching various database files for similar problems & fixes. Nothing worked. I was beginning to think that even though the So Fine thread worked well with the cotton top & cotton backing, Lizzie was very obviously having real problems when it came to the Dupioni silk. I was becoming more and more concerned about the continued quilting in the same area of the Dupioni and what it was doing to the integrity and quality of the fabric. I finally gave up on Lizzie and finished the quilting in the last border on my home machine. I also did the outline stitching around the machine-embroidered letters on my home machine. Precision outline stitching is VERY difficult with a longarm machine, so if you ask your longarm quilter to do that for you, be prepared to pay a high price. And finally, finally, I finished every single little stitch! The label, the hanging sleeve, the laundry label (DRY CLEAN ONLY!) and the binding. Everything was done. I don't think I've ever been so glad to be done with a project! 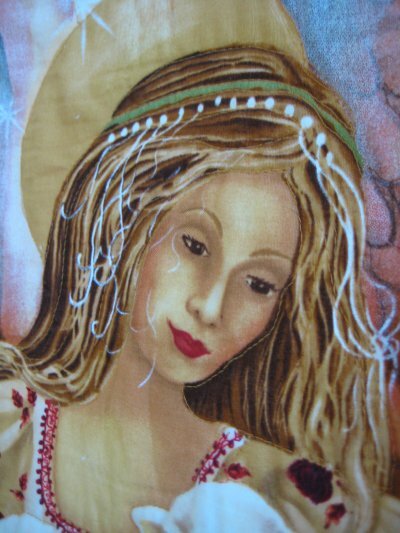 :-) And don't ever ask me to sew with Dupioni silk again!